Mack is 5’ 5.5” a size 34B, size 1 wearing a small. Leah is 5’ 2” a size 40D, size 11 wearing a large. Small: Waist 28" Inseam 28.5" Full Length 54.5"
Medium: Waist 29" Inseam 28.5" Full Length 54.5"
Large: Waist 32" Inseam 28.5" Full Length 54.5"
I love these overalls! I was worried about the fit because they are kind of like jeans with suspenders in the back, but they fit perfectly!!! 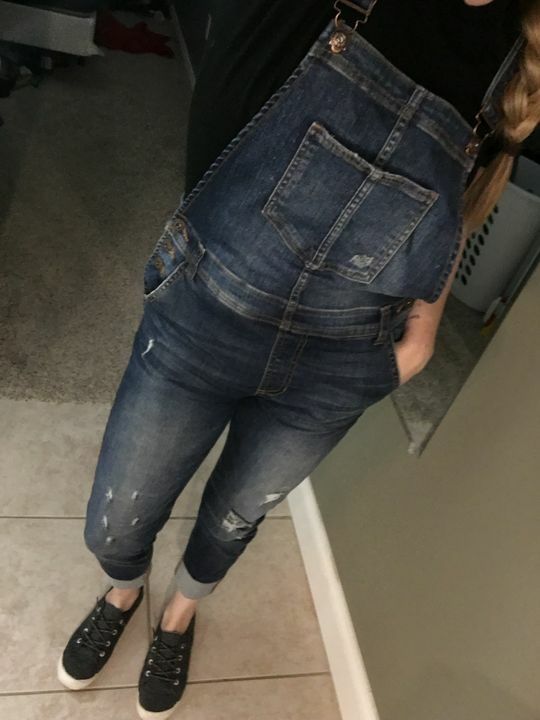 I LOVE these overalls! The fit is perfect and they are stretchy and so comfortable! I love rolling the bottoms up but you don’t have to. The fabric seems great quality. The review makes me select a size that I ordered but they come in Small Med Large, not number sizes. I ordered a Medium. These didn't work for me. My torso is long and they felt a little snug on the shoulders. Pants part fit well (got a small and am 5'5 and 120 lbs) but didn't look flattering in the mid-section.